2 thumbs up, Terry- nice going. Enjoy! I finally figured out how to increase sharpness of my jpegs. Both Natural and Bright are increased to 2. The default was already one. BTW, I was playing around with my 43, yesterday. I wanted to test the focusing accuracy, and there was a very colorful box on my kitchen table. I shot it at 1.9. The shot was amazing. The auto focus was dead on accurate. Nothing else in the picture was in focus. The colors were beautiful. I love that lens! Now that the adjustments are made, where do you suggest I leave it, on Bright? Or, do I try to match it to what I'm shooting? Just leave it on Bright for most everything. 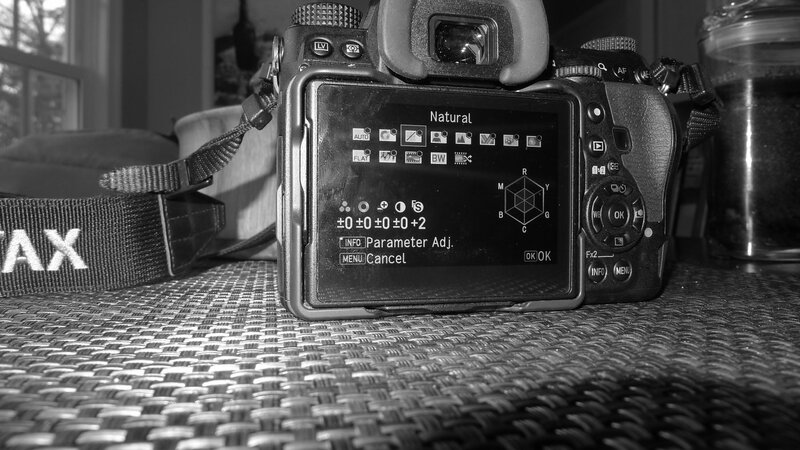 That is the best all-around setting, which is why it is the default chosen by Pentax. If you are doing people shots, and they seem to have too much blush in skin tones, or too much red in flowers, switch to Natural, which will reduce color saturation. But sometimes when people are looking a bit pale, the extra slight blush might actually be flattering, so if it looks good, leave it on "Bright". For very high contrast scenes, Natural is likely a preferable choice. For doing actual portraits, you might consider switching to the Portrait category instead of Bright or Natural. The palette is preset for that purpose, with less detail for smoother skin when that is needed. No need to adjust anything in this category. But it is only for that, so when done doing portraitures, be sure to switch back to "Bright". However, switching to Portrait is not always necessary. Sometimes you want a more robust look, and more detail in facial shots. Looks good. And it (#1) is a curiously interesting photograph in its own right. Caught my eye immediately. Terry: A RAW file is the actual data output by the sensor converted into a processable data string. Your camera - or external software such as Photoshop or Lightroom (or dozens of others)- ‘develops’ the RAW into a viewable / printable jpeg. A RAW is analogous to a film negative (for print films, not positives for transparencies) that has been developed from the raw film. Making an enlargement and printing it on photo paper (using techniques and skill to alter the final print) is equivalent to creating a jpeg. We’re suggesting for now you let the camera create your jpegs. The section on using the 4-Way Controller is your starting point. The reference to the setting screen for the processing defaults is where you will see the settings. The manual is very spare. It isn’t a How-To Guide*. At a point someone will reply RTFM. Take that in good spirit. Please look at my last post. Thank you. So, a 1 doesn't need to go back in the middle? Over time you will decide what works best for you. I only have Fine Sharpness +1 on Bright and Natural. The other settings are all default. Last edited by monochrome; 03-03-2018 at 12:59 PM. I advised going to +2 based on lab tests, and test reviews, indicating that sharpening level for the K-1's in-camera JPEG processor to be under-done (conservative), resulting in slightly soft images. Since +1 is default, advancing by one level seems logical. So that should work fine without being overdone. The sharpening level being optimized brings out good edge sharpness in subjects, and the Fine Sharpening brings out fine detail. 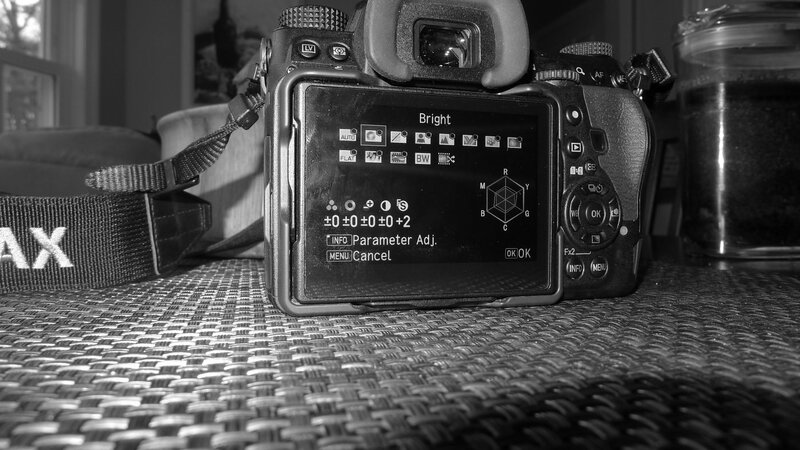 The old K10D was the same way, but its adjustment control was sadly ineffective. This control problem was fixed in all later models, so now we have a very good control system. Last edited by mikesbike; 03-03-2018 at 01:06 PM. It was advised by quite a few members. I certainly appreciate your help. Does anything go in the middle? I think it may of had 1. Thank you. Terry, it is beast to leave other categories as-is at least for now. The Portrait category is not set up to maximize sharpness, is one example, since that might not serve portraiture very well.. As to the the other adjustments in the "Bright" and "Natural" categories, they are fine left as they are. What you are showing us in your two photos of your camera settings above is exactly right, exactly the best settings for Bright and for Natural categories. Again, having your camera set on the Bright category is best for almost everything. Now that you've got your settings optimized, you can just go looking for good photographic opportunities and shoot some photos! Last edited by mikesbike; 03-05-2018 at 01:54 AM.